There is absolutely no way to keep a determined little girl from following her heart's desire into the land of the princesses. Once P's eyes were opened to the world of glittery tulle, flowing taffeta, jeweled tiaras, and glass slippers there was just no stopping her. 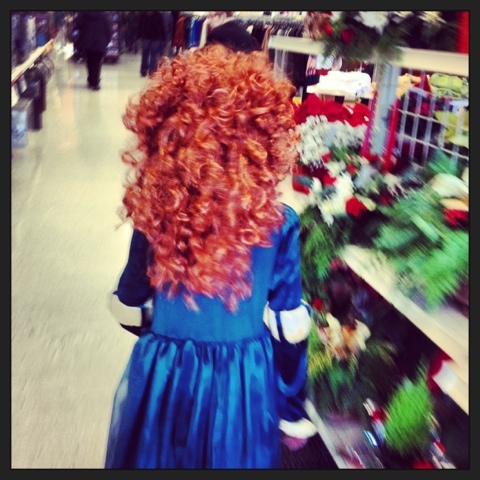 Since Merida has been introduced to our world she has become our world. P knows every line of every character from the movie. If she asks you to play "BRAVE" with her, you will be assigned a character and given your lines. If you do not say your lines exactly as they are said in the film with the same emotion and inflection then consider yourself fired! J has been sucked into the princess world too. He is fond of Rapunzel and often times asks for a frying pan or will quote Flynn Rider: "Are you coming blondie?" He plays the "BRAVE" parts assigned to him really well. They often replay the scene where Merida rips the tapestry. J is Elinor and knows every line. He then becomes Mor'du and the real fun begins!